$159.99 $74.99 53% off *Discounted price shown in red box. Pole mounts into a base. If nothing is chosen, we will choose at random. Flag Dimensions: 2ft (wide) x 10ft (tall). Flag will narrow as it goes outwards from the center. Double-sided Flag Option: We will print two flags and sew them back to back with a 100% block-out in the middle. There will be no visibility from one side to the other. Uses: Flutter banner flag can be used indoors or outdoors. We advise to use these flags outdoors only though because they do require wind to flutter around to display your message. Lifespan: If these flags are used periodically, they will last 3+ years. If used long term outdoors, these flutter banner flags will last about an year. Long term outdoor use is okay, but we do advise to take them inside during severe weather. Use under direct sunlight will speed the fading process. Storage: Store these banner flags folded neatly at room temperature. Keep them inside safe storage to prevent any damage from objects around it. Do not keep these custom flags outside in sheds, barns, or other high heat areas. A flutter banner flag requires wind to stay open, therefore you must be okay with your graphics not displaying if there is no wind. 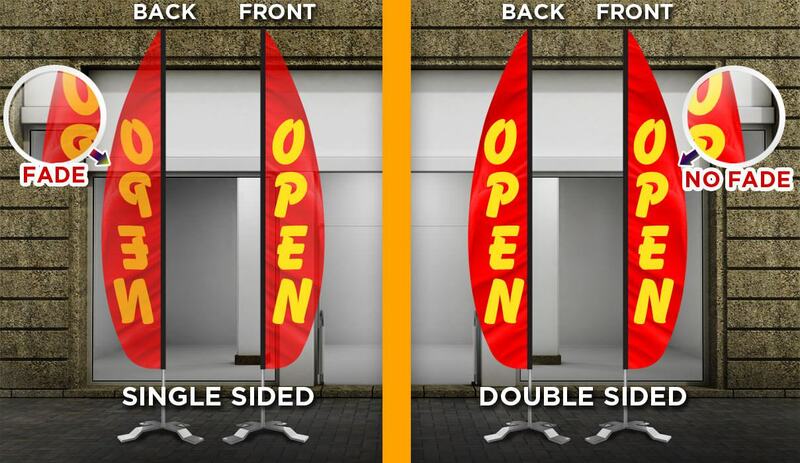 A gentle breeze allows these single-sided flag banners to open up and display your message. Double-sided flutter banner flags do require a bit more wind to open up but not much more. 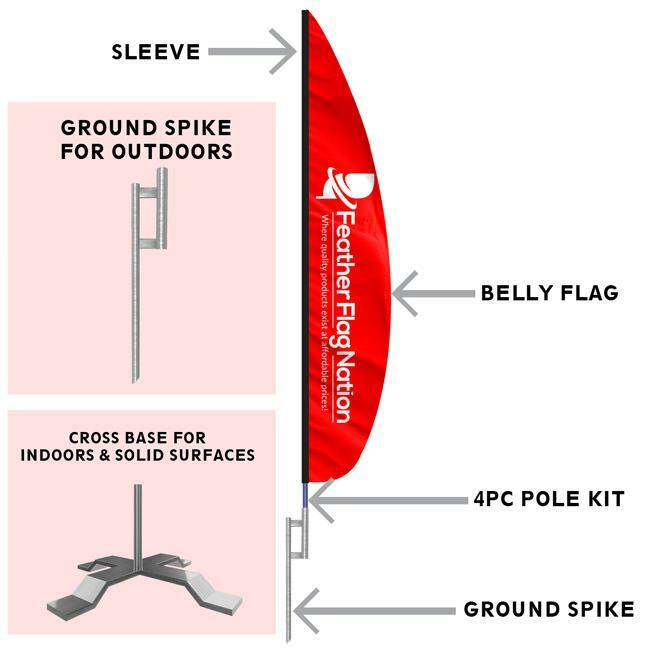 If you are looking for custom flags that are open at all times, with or without wind, our custom feather flags, teardrop flags, or rectangle flags would be best for you. All three of these flag styles are always open. We also have a few other custom advertising flags or stock feather flags that you can choose from. Browse through the options and see which will work best for you.